On the HP 48S and 48G, these keys are not labeled - but I will still use the F# convention. So [F1] means first soft key from the left, [F2] means second soft key from the left, and so on. I dedicate this blog to Peter Murphy - thank you for the request! This is a basic tutorial of reverse polish lisp (RPL). It is a combination of RPN (reverse polish notation), Lips, and Forth languages. RPL removes the need to enter parenthesis during long calculations and allows for immediate feedback during calculations; you will not need to enter a long operation before getting feedback - thus eliminating errors. A lot of times, the number of keystrokes required to make a calculation is reduced using RPL compared to algebraic systems. RPL works like RPN, but there several differences. All of the following calculators, manufactured by Hewlett Packard, operate on RPL: HP-28C, HP-48S, HP-48SX, HP-48G, HP-48G+, HP-48GX, HP-49G, HP 49g, HP 50g. Currently, only HP 50g is sold new. The rest can be found used (sometimes new) on other online vendors. There are also several emulators of RPL calculators (HP48+ for example) that can be used for the iPhone/iPod Touch/iPad and devices operating on Android. There are two types of RPL: User and System. User RPL is for basic, everyday use. You can create programs with User RPL right on the calculator's keyboard. System RPL allows users to create faster and more efficient programs. However, System RPL programming is more difficult than User RPL - most of the time programs have to complied and then downloaded to the calculator. For our purposes of the tutorial, we will use User RPL ("Just use the keyboard"). You can find additional information on RPL on the HP Museum of Calculators' RPL Page. The 28C displays 3 levels, the HP 48S and 48G series display 4 levels, and the HP 49G series, including the 49g+ and 50g can display any number depending on the screen's font setting. Typically, FONT 8 shows 7 levels. What is required of the user to execute a desired operation depends on the number of arguments (for our purpose, numbers) the function requires. Most calculator functions require one or two arguments. One-argument functions operate on whatever is in level 1, sometimes referred to as X register. For one-argument functions, simply execute the desired operation. One-argument functions include all the trigonometric functions (sine, cosine, tangent), logarithms, exponential (e^), reciprocal, square root, and factorial (x!). The change sign operation fits under the category of one-number operations because it simply multiplies the number by -1. The change sign operation is labeled [ +/- ]. 2. Press ENTER to terminate the first entry. 4. Execute the desired function. When you link more than one operation, it is known as a chain calculation. A simple example is adding a list four numbers. Another example is adding two groups of numbers and then multiplying the two sums together. The scope of this blog is just to give a very basic tutorial of RPL. It is a "do by example" tutorial. Keystrokes are shown in blue. All calculations on this blog are rounded to 4 decimal places. This blog will demonstrate keystrokes on the 48S (works also on the 48SX), 48G (works also on the 48G+ and 48GX), and the 50g (works also on the 49g+). [MODE], choose Fix 4 on the menu. Left Shift [LS]: This key has an arrow going up and turning left. It is the third key up from the ON button on the left side. It is orange on the 48S, purple on the 48G, periwinkle on the 49G, green on the 49g+, and white on the 50g. Right Shift [RS]: This key has an arrow going up and turning right. It is the second key up from the ON button on the right side. It is blue on the 48S, green on the 49G, light red on the 49G, red on the 49g+, and orange on the 50g. The 28C has 1 shift key - in red. In this tutorial I will put the label on the soft keys. [F1] mean the leftmost soft key, [F2] is the second leftmost key, and so on. Got it? Press the left shift key, then the square root key. The square function is just labeled as the left-shifted function of that key. As in any calculation involving subtraction or division, the order of the arguments is important. Sometimes it is useful to leave previous results on the stack while working on parts of the problem. The order of operations tells us to do multiplication first, then addition. Leave 17.7 on the stack for future use. We'll start by entering 200 and leaving it on the stack for future use. We are ready for the division. Take care of the fraction first, multiply it all by 2 in the end. #9: Find a decimal approximation, to four decimal places, of e^-3. Two common register operations are Swap and Roll Down. Swap: This operation swaps the contents on the X and Y registers. The key is typically labeled [x<>y]. The swap function is useful when arguments need to be switched before performing subtraction, division, and taking powers. In order to demonstrate the Swap function, let's enter the multiplication first. We need 2 on the top because we need to calculate 2 - (-5 x 3), not (-5 x 3) - 2. This is where the Swap operation comes in. Now with the arguments in the proper order, we can execute the subtraction. # 13: Calculate 200 ÷ 40, but enter 40 first, then 200. Here we can use the Swap operation to correct the order of dividend and divisor. We need to swap the arguments. Roll Down: This operation pushes down the contents of the register one level. You choose how many of the levels "roll" down. # 14 Roll down a three level stack. The Pi key (or keystroke sequence) puts π on level 1 and lifts everything else one level. # 15: Find the area of a circle with a radius of 2.35 inches. # 16: How many 5-card hands can be dealt out of a standard deck of 52 playing cards? 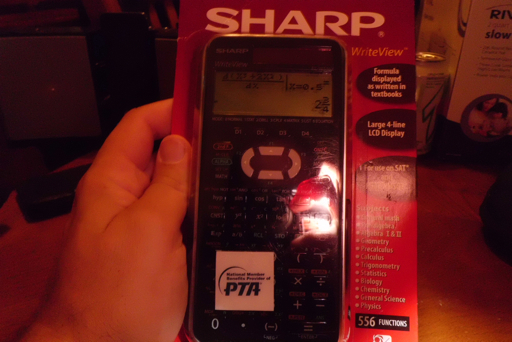 # 17: You have purchased a calculator for $99.99 and present a coupon for 15% for the purchase price. Assume sales tax is 8.75%. What is the final amount due? The percent function returns level 2 * level 1 ÷ 100 on level 1. # 19: While the calculator is in Radians mode, find sin^-1 (.5). Then convert the result to degrees. See # 18 on how to set the calculator to Radians mode. Your calculator is in Radians mode if the display has a RAD indicator on the upper left corner of the screen. I hope you find this tutorial on RPL helpful. This is a basic tutorial of reverse polish notation (RPN). RPN is an operating system that some calculators use, primarily those manufactured by Hewlett Packard. RPN removes the need to enter parenthesis during long calculations and allows for immediate feedback during calculations; you will not need to enter a long operation before getting feedback - thus eliminating errors. A lot of times, the number of keystrokes required to make a calculation is reduced using RPN compared to algebraic systems. Most displays will only show the contents of the X register. What is required of the user to execute a desired operation depends on the number of arguments (for our purpose, numbers) the function requires. Most scientific calculator functions require one or two arguments. One-argument functions operate on whatever is in the display, or the X register. For one-argument functions, simply execute the desired operation. One-argument functions include all the trigonometric functions (sine, cosine, tangent), logarithms, exponential (e^), reciprocal, square root, and factorial (x!). The change sign operation fits under the category of one-number operations because it simply multiplies the number by -1. The change sign operation is often labeled either CHS (HP 12C, HP 15C) or +/- (HP 35S). The scope of this blog is just to give a very basic tutorial of RPN. A lot of examples are provided to illustrate how to use the functions on an RPN calculator. GO-Sci 25, GO-Sci 21, just to name a couple. You can look for RPN calculators online, many are available for the iPod, iPad, and Android operating mobile devices. This tutorial is going to be a "do by example" tutorial. Keystrokes are shown in blue. All calculations on this blog are rounded to 4 decimal places. * Note: This works for most models. In these examples, you may need to press a shift key to access an operation depending on the calculator. Since this tutorial covers a variety of calculators, the shift keys are omitted. Please check your manual. As in any calculation involving subtraction, the order is important. Roll Down: This operation pushes down the contents of the register one level. The Pi key (or keystroke sequence) puts π on the X register (display) and lifts everything else one level. On a four-register stack, whatever was held in the T register is lost. #10: Find the area of a circle with a radius of 2.35 inches. #11: How many 5-card hands can be dealt out of a standard deck of 52 playing cards? The factorial function has several labels, typically x! or n!. #13: You have purchased a calculator for $99.99 and present a coupon for 15% for the purchase price. Assume sales tax is 8.75%. What is the final amount due? In RPN calculators, the percent function [ % ] returns Y * X%. The contents of the Y stack remain unchanged. #14: You deposit $1,000 in a bank account earning 3.5% interest for 5 years. How much money will you have after 5 years? Where FV is the future value, PV is the present value, i is the periodic interest rate, and n is the number of periods. We are looking for FV with PV = 1,000, i = 3.5, and n = 5. Set the calculator in Degrees mode if necessary. I hope you find this tutorial on RPN helpful. Many thanks to Xavier A. and Dieter on the MoHPC (The Museum of HP Calculators) Forum. Hello, everyone. In September 2011, Hewlett Packard released special editions of two of the most popular calculator models: the HP 15C Limited Edition and the HP 12C 30th Year Anniversary Special Edition. The HP 15C Limited Edition is a reissue of the HP 15C that was in the market during the 1980s. The calculator had a horizontal interface. 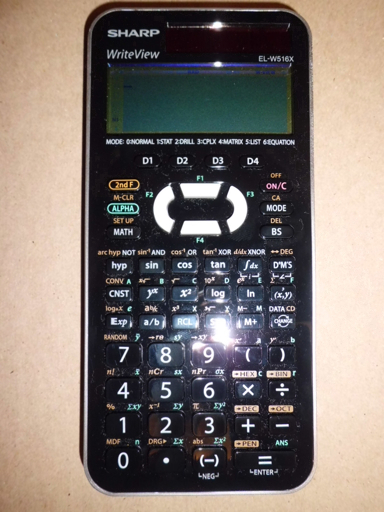 With the calculator operating in RPN (Reverse Polish Notation), users and fans of the HP 15C praised the calculator for ease of use and it's landscape shape. Features include: complex numbers, matrices, and keystroke programming up to 448 steps. The 15C Limited Edition box. The 15C Limited Edition Scientific Calculator. The 15C came with a written manual, which is probably a copy of the original 15C manual, a carrying case, and something really nice: a 15C emulator. I have yet to try the emulator but it is on the list of things to do. I am real excited to get the 15C Limited Edition. The new 15C is 100 times faster than the original model released in the 1980s. The Limited Edition is the first time in over 20 years that 15C calculators were produced. I understand that there are originally 10,000 calculators produced - hopefully more will be in the future. So if you want one, get shopping immediately! The HP 12C 30th Year Anniversary Edition is a celebration of Hewlett Packard's HP 12C calculator. Unlike the HP 15C, the HP 12C has been continually been in the market, ever since September 1, 1981! The HP 12C is a RPN Financial Calculator which features: time value of money, interest conversion, bond calculations, days between date calculations, cash flows, and keystroke programming. Most HP 12Cs have a memory of 99 steps, which includes the 30th Year Anniversary Edition. Hewlett Packard sells a Platinum Edition of the 12C which has a programming memory of 400 steps. The box contains a getting started guide and a carrying pouch. Enjoy the pictures, but these calculators are going fast. I have two 15C LEs and one 12C 30th Year Anniversary Edition. Last week I bought two Hewlett Packard HP 15C limited Edition calculators. The limited edition is a reissue of the HP 15C calculator, a favorite of many scientists and mathematicians. I also bought a 30th Year edition of the HP 12C calculator, Hewlett Packard's best selling calculator for 30 years. I plan to post pictures soon, but if you want to buy one, check out www.HP.com, www.buy.com, Bach Company, or Samson Cables. There is a lot of talk on the 15C on the Hewlett Packard Museum of Calculators forum ( http://www.hpmuseum.org/cgi-sys/cgiwrap/hpmuseum/forum.cgi ). It is a forum for fans of math and Hewlett Packard calculators. At the Azusa Swap Meet yesterday, I managed to pick up a TI-82 calculator. The TI-82 is basically the bridge between the TI-81 and the TI-83+/TI-84+ series. It is nice to fill holes in the collection. Hi everyone. 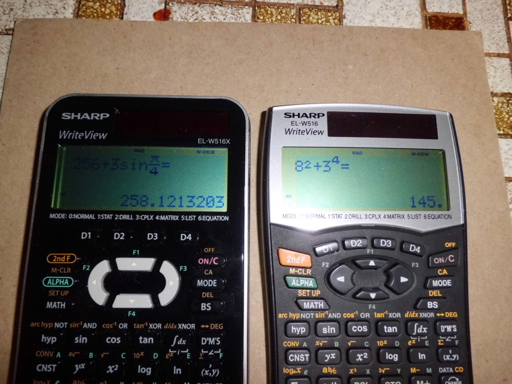 Today I am giving a short review of the Sharp EL-W516X solar calculator. I bought this calculator at Target for $17.99. The main features of the EL-W516X include: WriteView mode, statistical operations, matrix operations, base calculations, complex operations, and a drill mode. The drill mode tests your mathematical ability on arithmetic problems. While this mode has been panned, I find the drill mode enjoyable, and I challenge myself to see how fast I can correctly answer a set of questions. Generally, this calculator is a remake of the Sharp EL-W516 calculator. A picture of both models are shown below, with the newer EL-W516X on the left, and the older EL-W516 on the right. The set of operations of the EL-W516X is the same as the EL-W516. The normal mode allows you enter calculations in a linear format or a textbook format (WriteView ™). The textbook format reurns exact answers (fractions, fractions of π, square roots) whenever possible. Decimal equivalents can be accessed by pressing the CHANGE key (sometimes twice). Catalog. This calculator contains a catalog of all the functions available by pressing MATH, 0. The catalog is available in every mode. Calculus. Functions include single variable numerical integration, single numberical derivatives, and the sum function (Σ). I am happy to report that on the several tests calculations I made with the EL-W516X, the calculator boasts a faster processor than its predecessor. Base Operations.. The calculator offers five bases: decimal (standard), binary, octal, hexadecimal, and pental (base 5). To enter a base mode, all you Ned to do is to perform a conversion. To access the A-F in hexadecimal mode, you just need to press the corresponding key (no ALPHA key required). The logic operations (and, not, or, etc) are found in the catalog. Equation Solving. In addition to the ability to solve any equation in one variable (X), the calculator has solvers for 2 x 2 and 3 x 3 linear systems, and the quadratic and cubic equation. The general solver is in form f(X) = 0, you supply the f(X). Complex Mode. . This mode in my opinion, falls a little short. This mode can not use WriteView and it's operations are limited to polar/rectangular conversions, square (x^2), cube (x^3), and the arithmetic operations. I would have liked for it to do at least exponential and logarithms, as well as exponential powers beyond 3. Definable Functions.. You can store up to four operations in memories D1 - D4 for later use. Not very useful because what you can store is limited. Definable Formulas. You can store up to four formulas (including integrals, sums, and derivatives) in memories F1 - F4 for later use. I find this ability useful, you can store formulas for calculation or even for reference. The ALGB function (MATH, 1 in Normal Mode) can be used to substitute values for variables. Other. The calculator offers basic matrix, lists, and table operations. I like the sharp, crisp display of the EL-W516X. The calculator also has a faster processor - which means faster calculations (it pays truly pays off when doing numerical calculus). Function wise, this calculator has a lot to offer and us good pick up for anyone who wants an inexpensive calculator with a lot of function. 4 out 5 stars. Sorry I have not blogged in while. For the students: are you in school or about to go back? What math classes are you taking?